Laboratories consume more energy and resources than do spaces such as offices or classrooms. To put it concretely, a lab uses about five times the amount of energy, and at least four times the amount of water, of a typical office space. Then there’s the waste: In 2014, it was estimated that labs worldwide discard about 12 billion pounds in plastic alone. Add to that hazardous waste the gloves and all the other disposable items that are tossed out daily plus the energy used by the equipment and appliances, and it’s clear that the environmental impact of labs is nothing short of significant. As our energy use increases and our environmental footprint becomes more quantifiable, an increasing number of organizations look for solutions to reduce their resource usage. And while many such initiatives are easily adopted in office-type spaces, they tend to be more intimidating to those who work in lab environments. “For a lot of people, it’s a little bit daunting because people aren’t comfortable with the procedures and things that happen in a laboratory,” says Allison Paradise, executive director of My Green Lab, a nonprofit in California that aids laboratories with resource reduction initiatives. With the aid of organizations like My Green Lab, however, that attitude is starting to change. 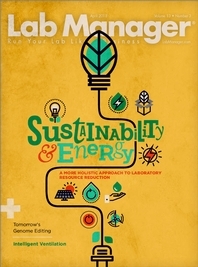 From making simple changes within existing structures to thinking about design before building a lab, more and more managers and those in charge are looking for ways to save resources and funds. The Pasquinelli Lab at the University of California San Diego (UCSD) studies microRNA regulation using the model organism C. elegans, with current focuses on how regulation of the miRNA pathway plays a role in aging, heat stress, and polyadenylation length. In 2015, the UCSD Green Labs program along with My Green Lab approached the Pasquinelli Lab to participate in a sustainability program. “I outright asked what sort of benefits there were for participating in this program, and the UCSD facilities member involved in the program mentioned that there might be opportunities to have older, nonefficient equipment replaced free of cost or with rebates for new green equipment, and it was also mentioned that in the future, UCSD Facilities was interested in retrofitting labs to use LED lighting,” says Ian Nicastro, Pasquinelli’s lab manager. Nicastro jumped on the LED lighting upgrade offer and asked whether in exchange for his lab’s participation in the Green Labs program, they could be the pilot lab for the LED lighting retrofitting. UCSD agreed. As a first step, My Green Lab presented Nicastro with an online survey to gauge the level of sustainability practices already in place. Paradise and her colleague then toured the lab space and met with the entire staff and went through the results of the survey to highlight specific areas that they felt could be improved upon. “These were very specifically tailored suggestions, for instance, acquiring outlet timers to use on our lab’s microscopy heating blocks and turning off hybridization ovens when not in use,” Nicastro explains. This approach is what Paradise refers to as a holistic one, or one that encompasses thinking about environmental, social, and economic sustainability as opposed to focusing on just one aspect of sustainability. Among My Green Lab’s key programs is the umbrella one, or green lab certification, where they ask labs such as Pasquinelli to essentially perform a self-assessment online and better understand what they’re already doing. Although there have been programs in place looking at more sustainable building design for at least 20 years, enterprises like My Green Lab are relatively new. When Paradise started the nonprofit some four and a half years ago, there were maybe 10 or 12 programs nationwide that addressed lab sustainability. Now, she says, there are upward of 60 such programs across the country. This means Paradise and others like her have been doing a good job of getting the word out. And with the news rapidly spreading, sustainability initiatives are becoming more widespread. For Bryan Cannon, design principal at HGA Architects and Engineers, some of the greatest challenges and most promising trends in green laboratory initiatives have to do with air flow management and electrical power demands. Lab benches, according to Cannon, are also an exciting frontier in energy demand reduction. Just as Paradise’s organization often notes and reminds clients, lab equipment draws a lot of power, and practices such as turning off and unplugging apparatus when not in use can make big differences in overall sustainability initiatives. “Investing in dedicated power circuits that support truly essential pieces of equipment and allowing unused items to go dormant when people go home can make a big difference,” Cannon says. With the rise of sustainability practices, the design industry has also come a long way in terms of lab buildings. For example, some 10 years ago, common wisdom was that radiant or chilled beams don’t work in labs. That notion has since been refuted. Matthiessen and her colleagues have had remarkable success working with scientists to understand and address their specific needs, while finding ways to reduce plug loads without impacting their work in any way. These efficient ways of adopting sustainability practices, which are often very commonsense concepts that involve saving energy and reducing water use, have immediate and clear financial and environmental impacts. Though for some, the end result is further removed. “I think the disconnect that some folks might have with these practices is due to the fact that labs aren’t responsible for their power bills directly, so some researchers might not think about how cutting power consumption helps them directly, but not only is it good for the environment but it also frees up money for the university to use for other projects and programs that might benefit the labs directly,” says Nicastro. Prior to participating in the sustainability programs, Nicastro’s lab was already very proactive with recycling and using washable glassware when possible, as opposed to disposable plastic. Their biggest challenge was turning off equipment when not being actively used and working to acquire more energy-efficient equipment and items made up of recycled contents. 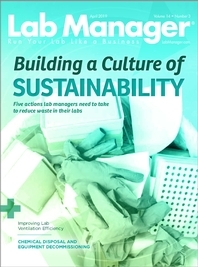 “I think it’s also important that Green Labs highlighted how keeping lab spaces clean and organized helps with sustainability, as practices like having an annual lab clean-up day can reduce contamination issues and therefore reduce wasted reagents and plasticware, while disposing of no-longer-needed samples from freezers can free up freezer space so the lab doesn’t need to acquire or operate additional freezers,” he adds. It’s true that much of what’s been surrounding sustainability has come in the form of basic changes. However, technological advances such as energy-efficient equipment and advances in solar power have also played a vital role in pushing forward such goals. “I think that advances in lighting and solar power have been very important for this initiative, as far as bringing the costs down to a range where it makes fiscal sense for an institute to pursue adopting campaigns like LED retrofitting of lighting and installing solar panels on rooftops and over parking lots,” Nicastro says. Furthermore, for any sustainable initiative or design to work, function should define form in the way that a building is set up to perform as an efficient and supportive work environment, a productive space for human interaction, and a smart part of the natural world.